We schedule reasonably priced and safe hauling for all our own Foothills Ranch horses and provide custom transport as well. Hauling fees for the majority of locations within the USA and Canada are $695 for our own foals and $995 for our own yearlings and older horses. Please check with us for more details. We also transport commercially. We're legal custom transporters, National Safety Code # MB0997365 and D.O.T #1992018 , fully compliant and properly insured. If your non Foothills Ranch horse needs a ride please contact us for a quote. We pride ourselves on the service we provide ! 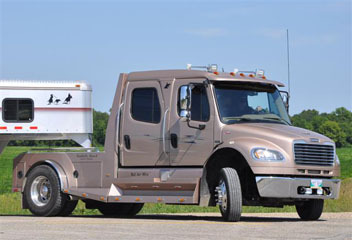 Satisfaction guaranteed with reputable horse handlers and transporters that put your horse and safety first. Miles and I personally transport horses ourselves and never cancel a trip, if you book with us your horse is guaranteed a ride. For American customers prices are in American funds. For Canadian customers prices are in Canadian funds, plus 5% GST. 1. How much will transportation cost be for my Foothills Ranch horse? We are pleased to offer our clients very reasonable hauling rates to most locations within the USA and Canada. For a flat rate of $695 for our own foals and $995 for our own yearlings and older, your horse will be delivered to an area near you. These discounted rates are to meet us on route, although yard delivery is also available. These discounted prices are for our clients who purchase a Foothills Ranch horse from us only. Custom rates are applied to all other horses we transport. Please contact us for a quote. 2. Are there any additional fees or is everything needed included in the transportation and horse prices? Delivery on route to an area near you. We often meet new owners at designated and pre arranged locations off the main Interstate or Highway. A large parking lot such as a truck fuel station or shopping center work very well. We'll lead your horse off of our trailer and onto yours in a safe location. For USA the horse price listed also includes: Neg. Coggins, International health certificate, border and broker fees, halter, electrolytes, hay during transport and stop over fees if required are all included. For Canada the horse price listed also includes: Halter, electrolytes, hay during transport, and stop over fees if required are all included. 3. What if I can't or don't want to meet you on route, can you deliver to my yard? Yes we can deliver to your yard however due to the additional time and mileage required there is an additional $100 yard delivery fee charged. 4. How will I know when my horse will be delivered? We will notify you when the date your horse will delivered is finalized. We can only finalize these dates mid August once we know how many horses are headed in certain directions and we coordinate transportation arrangements. We will contact each owner with this information as soon as possible. If you reserve a foal during the summer months, they will be delivered during the months of September and October once they're weaned. 5. What time will my horse be delivered? We cannot give you an exact time of day that the hauler will arrive because there could be unexpected delays such as inclement weather or traffic. Haulers will notify you approximately 12 hours in advance of the estimated arrival time. We will also do our best to keep in contact with all the new owners from the time the horses leave our ranch until they reach their destination. We will send updates as the horses travel. 6. What method of payment do you accept to purchase a horse and for hauling fees? Payments can be made by Email transfer, PayPal, certified checks, bank drafts, or any Financial Institution issued International money orders. We also accept Visa and Master Card payments directly, bank wire and direct deposit. 7. Do you haul or arrange transportation for any other horses other than those purchased from Foothills Ranch? YES however reduced prices listed on our website are only for our own Foothills Ranch bred / sold horses. These reduced prices are only offered to our Foothills Ranch horse buyers as a special Thank You rate. We're legal custom transporters, NSC # MB0997365 / USA D.O.T # 1992018 , fully compliant and properly insured. Please contact us for a individual quote to transport your horse. Click here for our Transportation Agreement for non-Foothills Ranch horses. For Broker Form for horses entering Canada please click here. 8. Can I still purchase a foal or a horse if the deadlines and dates you have listed have passed? Our foals are born in the Spring and are generally reserved during the summer months. Each fall during September , October and early November we deliver the weanlings that have been sold. If there are weanlings or older horses offered for sale on our website at any time of year, we guarantee delivery within the USA and Canada year round ! Please contact us for more details. 9. Can you tell me about insurance that is available ? If you already have an insurance company that you deal with , you may want to inquire on their current rates and what type of insurance they provide. If you decide you would like insurance on your Foothills Ranch horse please email or fax us the form provided by the insurance company of your choice. Our veterinarian will then perform a health exam and will complete the necessary documentation. Fax number 1-204-828-3676.
to ensure the safety and comfort of your horse. Click here for our Transport Power of Attorney for Export and Import.